Little, Brown and Company, 9780316254083, 192pp. The definitive book on schmaltz--a staple in Jewish cuisine and a "thread in a great tapestry," by one of America's most respected culinary writers. For culinary expert Michael Ruhlman, the ultimate goal in cooking is flavor, and for certain dishes nothing introduces it half as well as schmaltz. A staple ingredient in traditional Jewish cuisine, schmaltz (or rendered chicken fat), is at risk of disappearing from use due to modern dietary trends and misperceptions about this versatile and flavor-packed ingredient. 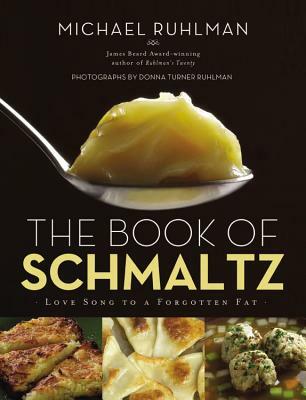 THE BOOK OF SCHMALTZ acts as a primer on schmaltz, taking a fresh look at traditional dishes like kugel, kishke, and kreplach, and also venturing into contemporary recipes that take advantage of the versatility of this marvelous fat. Potatoes cooked with schmaltz take on a crispness and satisfying flavor that vegetable oil can't produce. Meats and starches have a depth and complexity that set them apart from the same dishes prepared with olive oil or butter. What's more, schmaltz provides a unique link to the past that ought to be preserved. "Schmaltz is like a thread that runs through a great tapestry," says Ruhlman's neighbor Lois, whose cooking inspired his own journey into the world of schmaltz. "It's a secret handshake among Jews who love to cook and eat." Michael Ruhlman's innovative and successful food reference books include Ratio, The Elements of Cooking, Ruhlman's Twenty, and Charcuterie. He has appeared as a judge on Iron Chef and as a featured guest on Anthony Bourdain's No Reservations. He has also co-authored books with Thomas Keller, Eric Ripert, and Michael Symon. He lives in Cleveland, Ohio, with his wife, photographer Donna Turner Ruhlman.